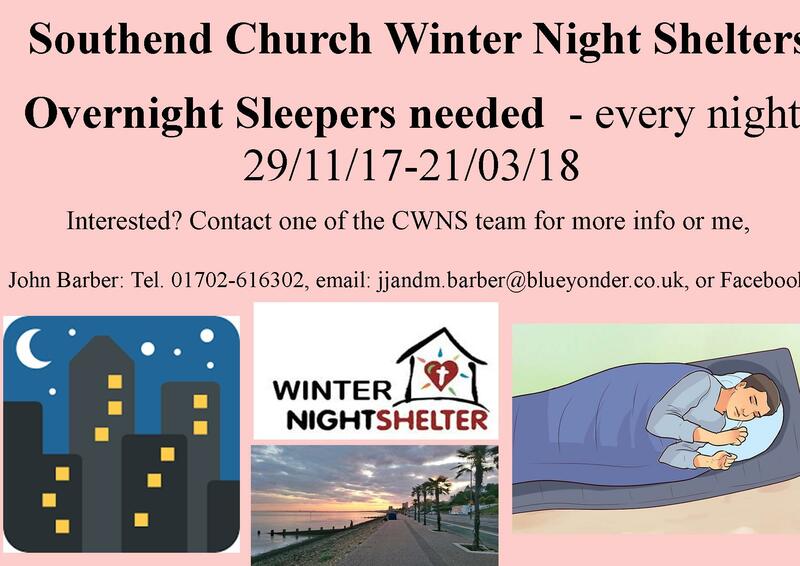 We are well into week 2 of 17 of the 2017/18 Church Winter Night Shelter (CWNS) and so far things have been going smoothly. Usually it begins slow as numbers of guests being accommodated are low and then things pick up as word gets around etc. but this year we really are hitting the ground running as numbers are full from the outset (Friday we accommodated 22 overnight sleepers, when our stated maximum is 20). And we have not turned away any yet who meet the minimal criteria for entry, although it begs the question should demand increase. As I write, I see steady downpour of snow. No doubt the cold weather we are seeing is a big factor. Reading reports from other shelters things seem to be going remarkably smoothly with relatively few major incidents to report. Given the vulnerability of our guests and the harrowing circumstances many find themselves in it is almost inevitable there will altercations and upsets but these have been few and far between, although for those of us who volunteer to help it is difficult not to be upset when contemplating what it is some of our guests go through, who often show remarkable stoicism. As I have said before running shelters (there is one for each day of the week) is no small undertaking, even given we don’t have the resource to carry on throughout the year. But thanks to our amazing volunteers (some of which are not churchy folk) who go out of their way to be helpful, we do what we do and make at least some small difference. If there is any doubt there is a need it is worth checking out the various soup kitchens (One Love – Monday and Thursday, Homeless Hub – Tuesday and Street Spirit – Saturday) who keep busy at the times the shelters are running. Visiting last night I was struck by the number using our services, many of which are genuinely homeless, a number I did not recognize (suggesting that while some are taken off the streets even more are added). It all points to the fact: even with HARP and CWNS combined – there are still homeless folk who will be sleeping rough tonight. We are blessed in Southend, for there are many good hearted people who out of compassion want to help. But the needs of not enough suitable accommodation and lack of support services to help deal with many of the things homeless face remain. As one friend has often reminded me: we are where we are and we do what we can do, even though we know it is never enough. As for me, I take a hard nose attitude in order to carry on, realizing there are unmet needs wherever I look and I try to focus on doing my bit as it were and encouraging others to do theirs, in the hope that we can overcome the scourge of homelessness. On a practical note, shelters operate because of volunteers prepared to fit in with where there are gaps (and one is the need for those to stay overnight with the guests – understandably the least social slot but in reality the one where there is least to do). Another is: while I could easily go down the list of shelters and when / where they operate, people who stay at the shelters need to go through HARP – and there are good reasons for this, and as I told one guest – not liking HARP is not an excuse. And can I say, without want to offend, while it great people want to help at Christmas time, our bigger need is for the rest of the year and for more people that consistently do what needs to be done. Like with advent calendars, I am peeling off the labels in my mind – two CWNS sessions down and fifteen to go (and yes when managing such an operation on a voluntary basis, it does tend to take over one’s life) – and it is a long haul with folk tired at the end. But I like to think it is all worthwhile. It is not about religion; rather it is about humanity – and the thought that by continuing to offer the services we do, we help to meet a need and we do make a difference. While that difference may be small, we are taking folk of the street and bringing them closer to being housed as well as showing kindness. Update 23/12/2017: We have just completed week 4 of 17 of the Ferndale CWNS. Whereas the first three sessions were relatively peaceful even if intense because of the need we serve, this fourth session was anything but and was more than a little fraught due to our dealing with a variety of challenging guest behaviour, some of it fueled by alcohol and Christmas craziness. But we survived and came through it all intact despite having to deal with a number of wicked situations. There is no doubt the need among homeless folk is as great as ever it has been. Without blowing our own trumpets, there is the satisfaction of knowing we are making a difference. Update 30/12/2017: Funny how things can change hugely in a matter of a week. Last week was particularly challenging because of having to deal with a number of what appeared unrelated but were likely related assorted behavioral issues, any of which can and did drastically affect the tone of the session and this week none to speak of despite there being a huge underlying need and as I discovered a drug culture affecting some guests and some serious not entirely resolved relationship issues. Sadly, we had to impose a temporary ban on some offenders and that helped. Mercifully, it was a peaceful and productive session and one where we did some serious good. Highlight for me was one particularly vulnerable guest asking for prayer. The show continues and we are almost a third of the way through the season. We are blessed having a fantastic team. Update 06/01/18: I have to confess it was with a degree of trepidation that I faced doing night’s session, given in the previous two nights the shelters were disrupted because of in the main to some challenging guest behaviour (always a possibility given the circumstances, and that despite every good intention and practice to handle all situations). But another session is over and we are over a third of the way into the season, which I would put in the mostly peaceful and productive category. Numbers of overnight stayers were down compared to previous weeks and our having as a collective told certain guests they were not welcome to attend for a period due to unacceptable behaviour (and has an important bearing on our delivering the service we want and the well being of guests and volunteers), which all had an important bearing on the success of the night. Talking to individual guests, it was clear the needs were as great as ever and while we cannot purport to do more than scratch the surface, in providing this service we find we do make a difference. It is humbling to know guests value what we do and when volunteers (including new ones) give up much to help. Update 13/01/18: 7 down, 10 to go! I love doing this but also look forward to the end. Given some altercations earlier in the week and we were down on evening volunteers I was a bit apprehensive – but always the adage “hope for the best but prepare for the worse” applies. The session turned out to be remarkably peaceful and productive although when getting to talk with guests I am always struck that despite the struggles faced due to being homeless and to do with mental health, alcohol dependency etc. most remain stoic and optimistic and there were several positive exchanges. It was good to be reminded while it doesn’t appear we do that much, we do make a difference; the example given is a number of our previous guests have been accommodated and moving on with their lives. Update 20/01/18: The show goes on! A particularly peaceful and productive night. Lots of guests grateful for what we provided and some particularly vulnerable and needy. We operated at full capacity (22 overnight guests) but great effort by our team of volunteers. Update 03/02/18: I suppose that’s how I feel just before night shelter begins, never being entirely sure how things are going to turn out. “Hope for the best and prepare for the worst” remains a sound approach, for one never knows whether the situation one is about to face will lead to peace and harmony or conflict and disruption. As it turns out this week and the week before the former was the case, with nothing hugely significant to report. It was nice to bring in new volunteers who, heart warmingly, enthusiastically enter into the spirit of things but it did mean repeating instructions like which tables to use, the need to stack chairs no more than 6 high and the contents and layout of the storage cupboard, making slick and well-oiled as much aspiration as actuality. One of the nice things about our volunteers is they really do represent a cross section of our society but are able to pull together in a common cause. At the end of this session, while feeling on the tired and weary side, there was also a sense of fulfillment and elation, having made some difference, for when one does dig a bit deep one is mindful of the underlying human needs. So now it is: 10 down with only 7 more to go! One nice thing is that 20 of our guests this season so far have now been housed and others are in a better state due to CWNS. Update 10/02/18: Another relatively peaceful and productive session, serving 21 overnight guests, and now only six sessions to go – and then what? People ask why end when the need is so evident. The problem is illustrated when one of the other shelters earlier in the week sent an SOS call due to shortage of volunteers, thankfully now met. The answer is we can only do so much and at least we can cover the worst times weather wise, and yesterday was cold and this had an affect on the mood of guests, many of which were keen to sleep as soon as practicable. As for peaceful nights, the last couple of weeks in all shelters this has been the case, much to the relief of my CWNS manager colleagues! But we did have one altercation between guests, not witnessed by volunteers, which was quickly dealt with but could have turned nasty, illustrating why vigilance is needed. We had three self referrals last night, not something we encourage but sometimes unavoidable and each dealt with due to circumstances. Two I knew well but one I didn’t, and to make it more difficult we had little to go on concerning risk assessment. But as is often the case heart ruled head and I am glad we made a place available. Update 24/02/18: Another skipped week diary update wise and the reason was the previous Friday/Saturday operation was almost event free with nothing particular to report other than we were busy and enjoyed a peaceful and productive session. As for the session just over (23-24 February), that was also relatively event free but we were very busy (we had 25 guests sleep overnight) and there were still many needs and some fraught moments (fortunately nipped in the bud). One was working around our temperamental oven. The same pattern can be seen at other shelters (going on reports received) and sadly a few have been turned away during what is a particularly cold spell. My shelter has only four sessions left to run and the question remains: what happens next, and with the likelihood some churches may not be participating in the CWNS scheme next winter, is an important consideration given the ever growing need. As I remind volunteers and guests, we do what we do as best we can, realising our limitations and knowing a lot more is needed. I am heartened with so much bad in the world there are good people who try to make it better and guests who benefit from what we offer, although sadly a few are stuck in the revolving door of unresolved drug and alcohol addiction and mental health problems, and some can’t or won’t engage in the CWNS program. Update 03/02/18: The big news since last week is the snow has fallen. This has had big implications for the shelters in that we needed to be extra vigilant and flexible when it comes to welcoming guests and that the snow meant that certain volunteers couldn’t do their duty, meaning others were needed to fill in, which thankfully they did. An interesting and significant development is that the local council have opened its own temporary emergency accommodation (covered here). It is just as well given all the CWNSs have been over capacity and the new shelter has also been busy. As for the night just gone, it went pretty well although there were some mini dramas, mainly to with altercations involving guests, this time during the night, the one slot I generally manage to avoid. I think we came through it pretty well but it again highlighted the need to be well organised, better communicate and give and take, especially given both volunteers and guests can easily be wound up when the situation becomes tense. A lot of needy people were helped by being with us, making it all worthwhile, but not all, sadly. One guest was discovered freezing near Shoebury station and was brought to us in the early hours by a concerned passer by, but at least we helped to some extent but also mindful there was a lot of undefined and unmet needs still. Two more CWNS sessions to go and then what? Update 10/03/18: The end is indeed now well in sight and for those of us who are regulars the prospect of life returning to normal. Little apprehensive as there had been some altercations at other shelters early in the week. All shelters were full and meeting needs. After one more busy but productive night we are left with one more session to go. There were some behavioral issues to deal with but all eventually resolved, including the worst offender helping clear up, and to counter that we were able to listen empathetically to guests’ concerns. We were tight on evening staffing as a number called off on the day, meaning more to do for those who were there – from looking being over staffed to being understaffed, but we coped. One trick we played and we could do more of is getting willing volunteers to help and when that happened it worked. We had over our maximum and at one point it looked as if we would turn away some self referrals but we managed to accommodate everyone, including one 19yo that had been asked to leave her family home earlier that day. While we know we have made a difference, evidenced by the fact several past guests have found permanent accommodation, some now face the daunting prospect of life again on the streets. Update 17/03/18: So that’s it – my season is over bar some final bits of clearing up, a volunteer debrief evening and a washup meeting of CWNS managers. Whether this marks the end of the winter season remains a moot point as outside I see recently fallen snow, but as far as the overall program goes this finishes in four days time. Inevitably there is a sense of relief especially as one of my deputies used to say – no one has died but also we can revert to normality in our house knowing we have done our job. And sadness too, for a lot more needs to be done. Last night was busy but calm. And big needs were being met, evidenced when late last night a guest who might otherwise have slept on the streets was brought to us by the police. Lots of people have been helped in a way that would not have happened if CWNS did not happen, this I have little doubt. I have little doubt there were some things we (all seven shelters) could have been done better and while we had our fair share of dramas linked to anti-social behaviour we served a need and plugged a gap, even though there are many unmet homeless related needs still. The question is begged: what will happen to the 20 odd guests that no longer have CWNS to attend and the 50 odd rough sleepers living in Southend (assuming the recent rough sleeper count is correct) who for one reason or another do not participate with the CWNS program? I am grateful to a wonderfully diverse group of volunteers and some wonderful guests. While the next eight months gives me a chance to return to some sort of normality, I have no doubt there will be other homeless related stuff to attend to, and especially given there are many loose ends to tie up and things to do. Whether there will be a 2018/19 CWNS season, I can’t say, but there does remain a big unresolved homeless need. Update 24/03/18: Not a shelter to report on this time but last night we held a volunteer debrief followed by a meal before parting ways for a period. Some volunteers couldn’t make it but most did along with their partners and some of our amazing supporters. It was a pleasant occasion and Mrs B excelled as she invariably does as chef for the night doing both Indian and an English roast. It was a happy occasion and there was a lot of positive feedback and interactions. Most are up for doing it again next season but for the now that seems a long way away. For me a break is welcomed but given the unmet homeless needs around me I dare say that won’t last long and tonight I will be joining the folk at Street Spirit. I am thankful to God that we were kept safe during the season and did a good deal of good, yet without getting complacent as today’s broken society reveals many broken people needing help to be restored. Update 07/04/18: This is my last entry to what has turned into a reflective diary of my experience managing one of the night shelters in the 2017/18 CWNS season. Things will be going quiet for a while on the CWNS front, having just attended the final managers meeting of the season. I daresay things will kick into life again in September in preparation for another season. Whether there will be a 2018/19 season remains to be seen but one is hopeful even though one of the churches will not be taking part and a number have still to decide. Most managers looked back at the season just gone with a degree of thankfulness we made it through the season and while there were many challenges like dealing with bad behaviour and maintaining a consistent approach, and some set backs, including getting guests into more permanent accommodation only for them to revert back to the streets, a lot had been achieved and we did help make a considerable difference in the lives of many. This is not a time to rest on one’s laurels though as the homeless need continues to increase and there are ways we can improve. For the time being I can take a step back although there will still be stuff to do on the homeless front and as tonight’s visit to our soup kitchen demonstrated there are many needy rough sleepers needing our help in a variety of ways, beginning as is generally the case, with a touch of human kindness. I hope to be back in some capacity for next year but that is not a decision I can make now. So watch this space and remember the needs are considerable and there are things each one of us can do. → Are UK Politicians losing the plot? i have found premises big enough to be transformed into a Night Shelter for our homeless friends.If we are able to secure it are you able to help run it ? If so write to me at scbookshop@aol.com Thank you Paul Slennett ,Southend Christian Bookshop. Let’s talk Paul. I’m not volunteering for anything but it seems there may be a window of opportunity that we ought to explore. I honestly think you all do a marvellous job helping and caring for these vulnerable people. I would love to help but my wife Verina believes with the volunteering I do with Age Concern and my current health status I would be pushing myself one step to far.